This flower-crazy phlox rocks! ‘Popstars’ quickly transform a border into a razzle-dazzle galaxy of tiny starlike blooms in ultravivid colors. From June through August, free-flowering phlox cultivar flings out constellations of bright-eyed blooms, petite bicolor stars with serrated edging and marbled coloring. Compact, prodigiously floriferous 8-10 inch plants perform magic in the border and dazzle in a patio container. Easy-to-grow, self-cleaning plants tolerate all kinds of weather. Sow phlox indoors 8 weeks before the last frost. Sow seed 1/8 inch deep in seed starting formula. Seedlings emerge in 11-21 days at 65 degrees F.
Give plenty of space when planting to ensure good air circulation and prevent powdery mildew. Prepare the bed by turning the soil under to a depth of 6-8 inches removing any debris, and lightly raking as level as possible. Plants may need extra water in dry periods but are generally tolerant of high heat. Pinch off spent flowers for continuous bloom. 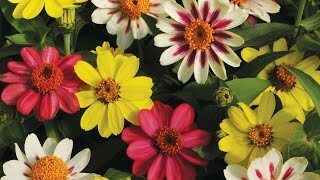 This colorful annual can be used in beds, borders, rock gardens, edgings, patio containers, and cutting gardens. It looks marvelous massed as an annual groundcover.